A 5th wheel toy hauler, also known as an SURV (Sports Utility Recreational Vehicle) or SUT (Sports Utility Trailer) has all the features of an RV, with the added bonus of a built-in garage. It's designed for those that just can't camp without bringing their big toys along. Those "toys" can include ATVs, motorcycles, snowmobiles, jet skis, or whatever else takes your camping experience to the next level. Fifth wheel toy haulers feature a built-in loading ramp and cargo tie downs, making it easy to load up and secure your motorized toys. A doorway between the garage and living area allows access to the garage from the inside. Many models include movable beds, sofas, and tables that transform the garage into additional living space once the toys have been unloaded. Toy haulers have become increasingly popular within the last few years, and it's easy to see why. Having a garage is like having a blank canvas. It's a space for whatever you need space for...office, workshop, kids play room, gym, art studio, or heck, even a garage! The possibilities are endless. 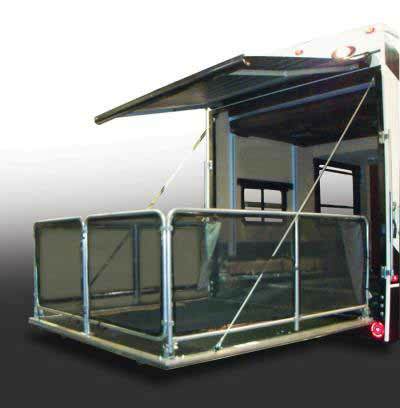 The 5th wheel toy hauler provides a well protected room for your motorized toys. That's one way to use this space. 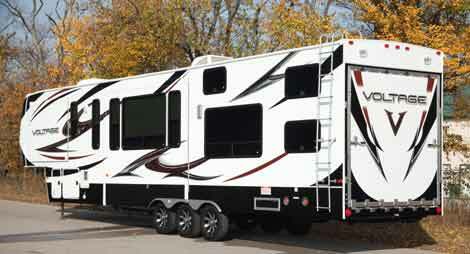 However, there are several other reasons why you might choose this type of RV. Here are some ideas of what you can haul, and other ways you can utilize this space. Hauling a motorcycle? You may find it difficult to keep the bike upright while bouncing down the road. If so, it's a good idea to get a motorcycle chock like the Condor Motorcycle Pit Stop/Trailer Stop to keep the bike upright while towing. Some fifth wheel toy hauler manufacturers can install a motorcycle chock such as this at the factory. You don't have to be an adrenaline junkie to enjoy the benefits of having a built-in garage. This space can easily be transformed into whatever your heart desires. Here are some ideas. 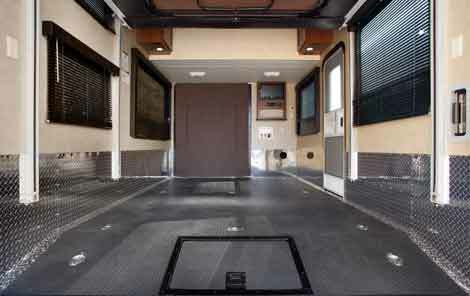 There are many innovative features found on today's toy hauler RVs. 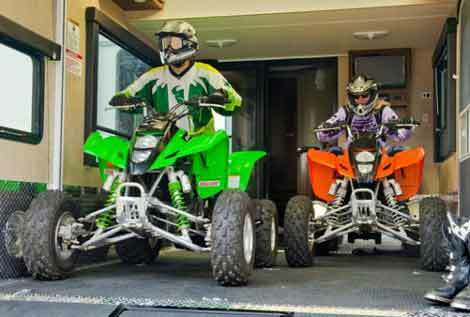 Manufacturers have come up with gadgets perfectly suited for camping with motorized toys such as onboard fuel tanks, loading ramps, and toy locking devices. 5th wheel toy haulers stand out among lesser types of toy haulers by taking camping comfort to the max. These toy haulers certainly don't scrimp on features. 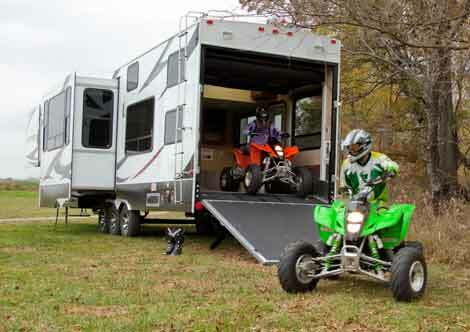 Most 5th wheel toy haulers include features like these either as standard or optional equipment. Fuel tank with pump for gassing up your toys. Yes that's right, most come with a built-in fuel tank and your very own filling station. Talk about spoiled! Ladder for roof is typically portable, meaning it can be removed - a good thing when it comes to deterring theft, especially if you've got thousands of dollars worth of RV solar panels on your roof! Outdoor weatherproof stereo speakers allow you to take the party outside. Stone guard for front and sides of trailer. Outdoor toy locking system - keeps your toys safe and secure while you sleep. Scare lights - these are outside flood lights installed on each side of the 5th wheel toy hauler that can be turned on from the inside. Good for spotting unexpected guests, or "scaring" would be thieves. Clothes Washer and Dryer Hookups - for installing an RV washer/dryer combo. Beaver Tail Rear Floor for easy loading - This means the floor angles downward at the rear. This design reduces the "hump" between the loading ramp and garage floor making it easier for low clearance vehicles to be loaded into the toy hauler. Rear Screen Wall for use when the cargo door is open - Keeps the insects at bay while you enjoy the fresh air. Entertainment System - Many of the larger units offer a garage with its own entertainment system including flat screen TV and stereo speakers. Bet your garage at home doesn't have that! And we call this "camping"!? Floor Storage Compartment for tools, parts, oil, etc. With an RV decked out like this, you'll have to step out every once in awhile just to verify that you're still in an RV! Most apartments would be put to shame when compared to these rolling palaces. Large luxury models come standard with some of these features, and on others you'll find they are optional. 2 Bathrooms - Many will have a bathroom next to the garage in addition to the main bathroom near the bedroom. If there ever was an RV built for boondocking, this is it. When playtime comes, toy hauler enthusiasts head for the deserts, mountains, and forests...and they need an RV that's up for the task. Tackling rugged dirt roads is part of the job, and that's why these RVs are built tougher than the rest. This rig also needs to carry plenty of supplies for self-sufficient camping, as hookups are rare in these wild lands. That's where 5th wheel toy haulers really shine...they have the space to store the goods. They also feature large holdings tanks, large propane tanks, and large battery compartments. A built-in generator is usually an option - and a good idea if you plan on staying in the boonies for more than a couple days. You can charge your RV's batteries with it, and you'll also be able to run the microwave, air conditioner, and other high powered devices with it. Large tanks - Many models have freshwater tanks that hold upwards of 100 gallons or more. The waste water holding tanks are quite large too. The bigger the tanks are, the longer you can camp. Built tough to handle rough roads. The chassis features rugged suspension and some models have shock absorbers to soak up the bumps. Lots of room for storage, which is great for extended boondocking. Large propane capacity - Most can hold 14 gallons or more. An inverter is usually an option, and required if you don't want to fire up a generator each time you use an AC appliance. Optional solar panel prep on some models makes installing solar panels easier. Charging the batteries with solar panels is the way to go when boondocking. Large battery compartment suitable for a good sized battery bank. Having 2 or more batteries for power is recommended when boondocking. Most models hold 2-4 batteries. Bi-level floorplan with a raised forward section. This creates an appealing interior and many enjoy having a cozy upstairs bedroom hideaway where they can relax and unwind at the end of the day. Shorter length of the truck and trailer combination when towing. Since the hitching point is in the truck bed and not at the rear of the truck, this shortens the overall length of the towing configuration. Better, safer handling and easier to maneuver and back up. Easier to hitch-up than conventional travel trailers. Since the driver can see the hitch in the rear view mirror, hitching can be done without any outside assistance. 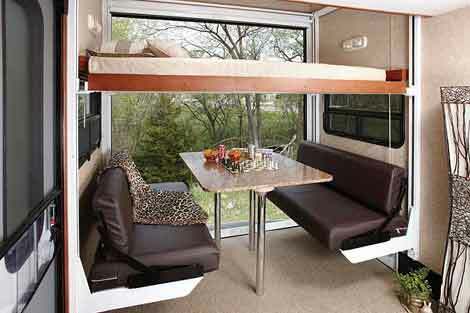 5th wheels make great traveling homes and are the RV of choice for fulltimers. Many have slideouts and are surprisingly roomy inside. Small Fifth Wheel Toy Haulers? The major downside, if you're looking for a smaller unit, is that there aren't really any small fifth wheel toy haulers. Almost all on the market today are 30 feet or longer. Hopefully manufacturers will be coming out with smaller units in the future. Right now you'll have to go with a conventional travel trailer toy hauler if you want to go small. It's unfortunate, because when it comes to safety and handing, a 5th wheel cannot be beat. The hitch weight may be much heavier than normal when the garage is empty. If carrying too much weight in the garage the hitch weight may be too light, creating handling problems. Some have a bunk above the garage, and sleeping above toys that have fuel and batteries is a big health hazard. This type of sleeping arrangement should only be used once the toys have been unloaded. It's a good idea to get the loaded and unloaded hitch weight figures before making a purchase. You want to know what the maximum (when the cargo area is empty) and minimum (when the cargo area is loaded to capacity) hitch weight is. Of course the hitch weight will vary depending on how much "stuff" you load the RV with and whether the freshwater and wastewater tanks are full or empty - therefore, finding out what the absolute maximum and absolute minimum hitch weights are is useful. 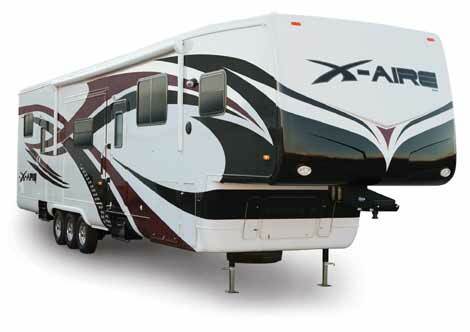 The optimum hitch weight is 20% of the 5th wheel's total weight. This will provide the best handling. If the manufacturer has designed the 5th wheel toy hauler correctly, the maximum and minimum hitch weights should not stray too far from this figure. Several manufacturers have jumped on the 5th wheel toy hauler band wagon, and competition is stiff. That's good news for you, if you like being knee deep in choices like I do - and quality tends to go up too, which isn't bad either. Happy searching, and I'll see ya on the trail! Feel free to leave me a comment about this page!